I am not sure why this is even being considered with the potential railroad issue going on. What these folks do not understand is that part of the charm of living where we do is that it is UN- developed. Old Lyme has had retail stores over the years and we can all thank Jeff Bezos for practically ruining the chance of a Mom and Pop stores. I am not sure why the town doesn’t do more to enhance Sound View. The railroad project is dead, the town is doing a great deal to improve soundview and the surrounding areas, and while Amazon does many things, it has no charm and that’s what people come to Old Lyme for, which is provided by our small businesses. There are a great deal of cars coming through the area and this plan attempts to give them a reason to stop, take notice and spend some $ here. That increases the tax revenue, which mitigates tax increases which increases resale value, and decreases our reliance on state and federal govenments. This kind of careful and thoughtful process is admirable. I am very proud of my town, how its is run, and the people who volunteer to do it. In my fifty plus years I have seen very little change to Sound View. Charm does not equate to retail businesses- ask the former owners of The Grist Mill, the Lyme Tree, and other retail stores that struggled. Charm exists in the areas that have not been touched by developers. I think it would be very sad to see condo complexes arrive in the middle of our town. I like it the way it is. I’ll go to Saybrook to do my shopping, we dont need generic stores here. We are already one of the lower tax towns in the state. Why do people want to change that ? Widen the walkways, make better crosswalks, make a small park near the Lieutenent river, make Lyme street accessible from Halls road. Let the developers put up their cash when they think its a good investment, and then regulate that through strong zoning. I very much appreciate Mr. Bernblum’s clear and reasonable answers to many of the questions that have been raised. His response gives confidence that that the balance of his committee’s deliberations will be open and fair. All citizens and stakeholders should find in this encouragement to participate in the process rather than sniping “sotto voce” in various forums regarding real, thoughtful and imaginative ways to improve our town and quality of life here. Thank you for this clear explanation of the process. I appreciate the opportunities for community input. 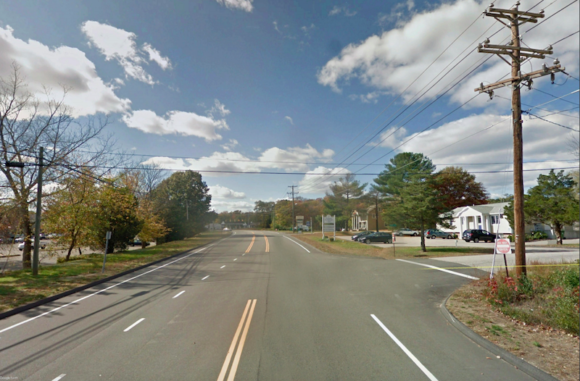 The reason to revamp Halls Road is to get people out of their cars, so they can walk around and spend some time in Old Lyme. I have worked at The Lyme Tree Woman’s Exchange for 17 years. When people choose to shop here, they want to experience carefully curated shops where they can find quality, locally-made merchandise, and just as importantly, catch up with friends and neighbors. This is what makes a community. I appreciate the careful way in which the Halls Road committee has approached the planning process for improvements to this area. The picture that emerges from the ideas and sketches presented by the Yale Urban Design Workshop is of a small but vibrant town and community center, more likely to attract -and retain- a healthy mix of younger and older residents than the sad, half-empty and deteriorating drive-through byway that is the current Halls Road. This area is clearly in urgent need of long range planning, development and action steps to prevent further loss of the fragile commercial infrastructure, small businesses and non-profits that are struggling to survive here. For some, the idea of any change to our much loved community is scary, but without some kind of change to make it more attractive to younger families, single households and other individuals who want/need to live within walking distance of essential services, there wont be a community. We need to turn the demographic tide away from our becoming a community of senior retirees (I am one), many of whom in any case will continue to relocate to more livable, walkable locations, with more retail, better services and lower or non-existent income taxes. We need to insure that our population and crucially, enrollment in our school system, doesn’t continue to decline; to insure that families needn’t choose to live elsewhere in order for their children to occasionally function independently, on foot! We need a plan for the staged development of Halls Road. We can be grateful that the town is in the process of creating one, and asking for our input.